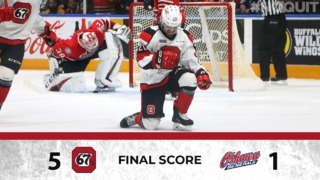 The Ottawa 67’s struck early and often on Sunday afternoon to close out the Thanksgiving weekend schedule with an impressive 6-2 win over the Sault Ste. Marie Greyhounds. Tye Felhaber led the charge with two goals and an assist, while Quinn Yule, Austen Keating, Kody Clark and Marco Rossi also had their names on the scoresheet for the Barber Poles. Cedrick Andree was also solid in front of the 67’s net, stopping 28 shots, while Rossie and Clark now have three goals apiece over two games this weekend. The first period was a high scoring affair, with a total of six goals scored in the opening twenty minutes. Felhaber opened the scoring, before Roman Pucek answered for the Hounds just about a minute later. Yule and Keating would then add two goals to the board, before seeing Morgan Frost cut the lead to lead to one with a power play goal. Clark would score before the period ended, sending both teams to the locker room with a 4-2 score in favor of Ottawa. The line made up of Rossi, Keating and Felhaber would be right back at it in the second, as Rossi lit the lamp in the opening minute of the second while Felhaber went on to score his 7th goal of the season in the final minutes of the period. The third period was scoreless, with the final buzzer announcing what was arguably the 67’s most complete effort of this young season. The 67’s outshot the Greyhounds 35-30 in this win. Ottawa dominated in the faceoff circle, edging the Soo 41-27 in that department. After today’s effort, Austen Keating is now tied for second in scoring in the OHL with 13 points in 8 games. After going scoreless in his first 6 OHL games, Marco Rossi now has 3 goals in his last two. Tye Felhaber leads the OHL in opening goals with three this season.